Things we did today...: Mosquito Screens - Check! I really have no sewing background at all! But somehow... give a girl a Sailrite and she'll make you... well, whatever you want! This time, it's mosquito screens/sunshade for the overhead hatches! I purchased so much of the Coolaroo Sunshade fabric for my deck awning project that I had plenty left over. I had planned to sew some mosquito screens for the hatches, but hadn't bought any fabric for that yet. I was so happy with the sunshade stuff, I decided that it would serve as dual purpose fabric for the hatches, sunshades AND mosquito proofing! A Facebook friend told me about a product produced by Velcro called Velstick. I purchased the loop side (in retrospect, I should have got the hook side) and we mounted it to the ceiling using small brass screws. Also, I couldn't find it in white, which would be my preferred color. The companionway was going to be a bit more involved as the doorway wasn't square. I'll save that one for last. The Velstick was VERY easy to work with. I used a utility knife to score a line on the back, then bent the stick to break on the line. Then I cut the fabric side with the utility knife. Very easy and no mess. The Velstick was in place for days while my mind worked over the plan for sewing the screens. Finally, while we were at the dock in Rockport, TX, I got brave and dove in. My workspace was a bit small and the Coolaroo fabric is kind of crawly, but I only ruined one square before I got it right. I cut two identical pieces as two of our hatches were the same. I found that I got a nice square piece by folding the fabric over in half and measuring half of the width, then folding it the other way and cutting the length. There is no way to do an exact "how to" for a project like this, since everyone's hatches are different. We have one hatch that is too close to a wall for us to mount the Velstik like the others. We ended up mounting it on the wood and following the Velstick with the fabric. It turned out great and still forms a positive seal against mosquitos. The sewing part, I just kind of "did it". I started with cutting the fabric with a one inch hem allowance. I turned each edge over 1/2 inch and placed a strip of regular 1 inch hook velcro on one side, and a strip of white webbing material on the other side. I turned and aligned the pieces as I sewed. I had planned on sewing in a loop of webbing on the corners to use as "pulls" to remove the covers, but when I got to the first corner, I just looped it over and continued sewing down the next side. It just takes a little thought to make sure that the hook strips are continuous and not cover them with the webbing at any point. We can just roll the cover to one end and it stays put. We don't have to find a storage place for them unless we don't plan to use them for a while. 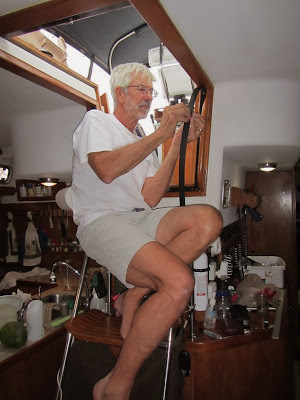 My original plan was to make one continuous piece to cover the companionway. I ended up doing it in two, first thinking that it would be easier... not, and secondly, I thought it would be nice to be able to remove one piece to get out, without removing the whole thing. It turned out well but I did miscalculate one thing. I added a 1 inch allowance for the velcro in the middle there on both pieces. I should only have allowed extra on one of the parts which would fold down onto the other. Instead of ripping out the entire bottom edge, we just affixed a second strip of Velstick below the bottom edge and it stuck right on. So that's it! Somehow I managed to "wing it" and get the job done. We are VERY happy with the outcome. I think the covers will be really nice on hot days when we don't want the sun bearing down on us... and for sure they provide an impenetrable barrier against bugs, maybe even no-serums. Oh that's terrible! I'm hoping that the screens keep the small critters out! Have you ever thought about buying (depending upon where you are of course) a screen tent? 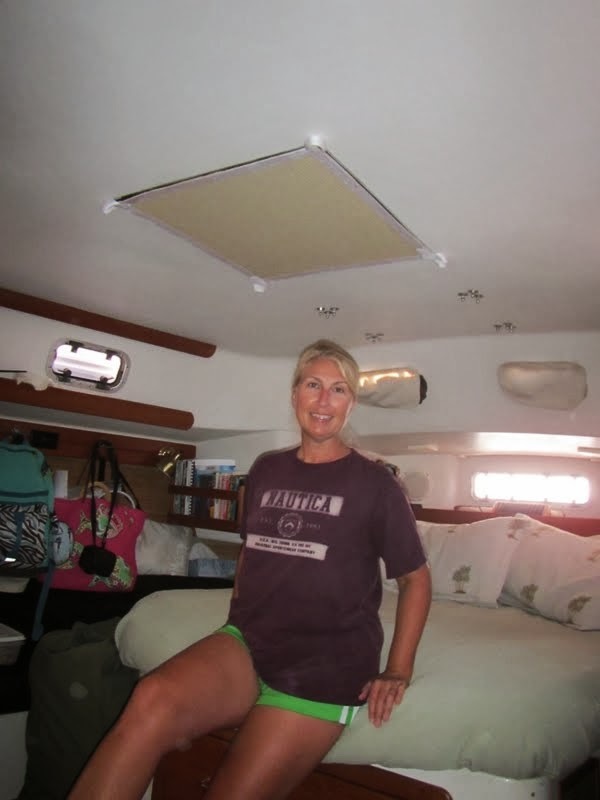 We bought an inexpensive one that fits nicely over our bimini with a zipper at the back. We plan on using it to keep our cockpit bug free. Still need to sew in some kind of weight in the bottom but haven't found the right stuff yet. Anyway, it's an idea, kind of a pain to deploy but if the bugs are bad enough and the winds are light, it could be a cheap way to fix the problem. That does sound like a great idea. I was thinking of a fan, as they get blown away in the slightest breeze, but netting wouldn't require power. Thanks for thesuggestion! We love the privacy and the sunshade aspect. If I need to, I can sew another layer with smaller netting very easily. You're welcome! They were so easy, everybody should have them.